Everybody Sees the Ants by A.S. King. Grades 7 and up. Little, Brown, October 2011. 282 pages. Reviewed from ARC snagged at ALA.
Every night, Lucky Linderman travels to the jungles of Vietnam where he tries, once again, to rescue his grandfather. Lucky's grandfather has been MIA since way before Lucky was born. But at least in his dreams, Lucky feels like he's doing something. Not like when he can't get his dad to talk to him or even stay home from his restaurant for one night to be with the family. Not like when Nader's beating him up and all the adults are too meek or too clueless to help. But after a particularly horrible incident, Lucky's mom takes him to visit her brother in Arizona and there Lucky will begin to take charge of his life and start to set things to rights. There's this moment... I guess not everyone necessarily has A MOMENT, but I know for me there was a time in my life when I realized that life doesn't have to be something that happens TO you. When you're growing up, ever since you were a baby, people were doing things for you. They carried you around. They fed you. When you got older, they made you brush your teeth, they carted you off on family vacations. When you're a kid, a lot of stuff happens TO you. But when you start to grow up, you realize that you can take charge of your life. You can make things turn out the way you want them to (well, you can do your best, anyway). This is one thing Lucky learns. There's also some time in your life when you realize that everybody's got problems, no matter how perfect their hair or how much money they make. Not only that, but sometimes problems are a lot more complicated than you could ever imagine. And sometimes the problems you see are caused by underlying problems you don't see. But everybody's got 'em. This is another thing Lucky learns. Everybody Sees the Ants is a story for anyone who has ever felt helpless. This is a story that I could just sink into. Lucky felt incredibly real to me and I truly enjoyed seeing him figure things out. He's faced with a lot of frustrations in his life... Of course, there's the bully making his life miserable, but there's also the fact that his dad is never around and that Lucky isn't able to get it across that he needs help dealing with it. He's screaming at the top of his lungs without making a sound. Lucky isn't the only great character in this book. A fleshed-out cast of supporting characters add to the authenticity of the story. I particularly liked the story of Lucky's aunt and uncle. As Lucky gets to know them, his perception of both of them changes almost completely, reinforcing the idea that you may never know someone's full story. Lucky's ants add humor to the story, keeping it from getting too heavy. This is a book about some serious issues, but the tone is not always serious. Check out more reviews at Stacked, GreenBean TeenQueen, Presenting Lenore, The Book Smugglers, and YA Love. 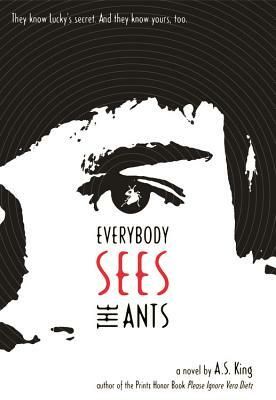 Everybody Sees the Ants is on shelves now!